Waste Pickers Around the World (WAW). This year, to commemorate International Waste Pickers’ Day on March 1st, we would like to share with waste pickers and allies the launch of our online participatory database called Waste Pickers Around the World (WAW). How many waste pickers around the world are organized? Where are these organizations located? These are just a few of the questions we hope to answer with WAW, the first global database on waste pickers! 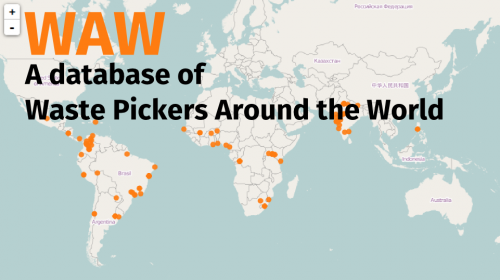 The WAW database includes a world map that shows where waste pickers are organizing across the globe. Be part of WAW. Filling out this form will only take 5 minutes and you will be contributing to a more accurate and updated version of WAW. Learn more about the WAW Database. Make your contribution towards a more complete and representative database! Visit globalrec.org for upcoming posts about International Waste Pickers’ Day 2015, including a press release and call to action from Colombia. Read more about International Waste Pickers’ Day and past actions.